A knowledge organiser (KO) sets out the important, useful and powerful knowledge on a topic on a single/double page. 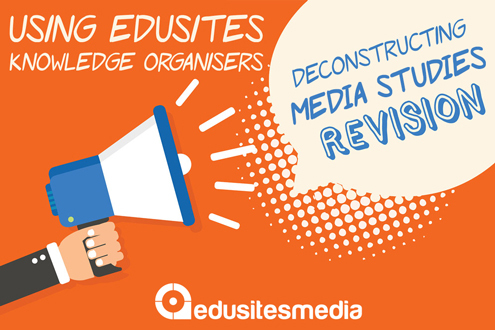 Each of your exam board's set products have an Edusites printable knowledge organiser for your convenience. Each knowledge organiser has sections for the specified areas of the Theoretical Framework and Contexts specified by your exam board for each product. This scaffolding approach offers students pointers when working with the set product to identify the important information to memorise. These are 'Smart' Organisers designed specifically to suit the study requirements of each media product - In-Depth, Targeted, Comparative or Explicit. Click on the links for your exam board below. All printable PDFs are accessible with a school or individual subscription - click for more details.